Christmas is drawing near and you forgot about sending out those Holiday Greeting cards didn't you? Don't worry! Everyone has long Holiday to do lists (especially Santa) and sometimes there just isn't enough time for holiday cards. So we're introducing Holiday Foil Frames, a quick way to add some shine to your holiday card or photos. The frames are available in four patterns - christmas sweater, vine, dots, and holly berry. See what a finished card looks like with a photo and letterpress greeting. The Holidays are here! Tonight is the second night of Hanukkah and there are only 17 days until Christmas. There's still time to finalize your holiday cards if you haven't yet. As the holidays draw closer, we're reflecting on Christmas / Holiday cards past. This custom holiday card was hand illustrated, foil stamped in gold, and backed with a photo. The cards were paired with a kraft envelope with a foil liner (gold) and foil return address (red). Today we're sharing a custom holiday card we printed for Pernod Absinthe. 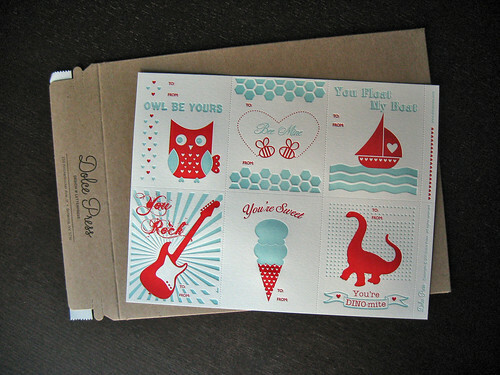 These cards feature a hand lettered design and a beautifully illustrated cover. It's always interesting to see the variety of styles for holiday cards. The cards are printed on Crane's Lettra - the 100% cotton paper allows for a deep impression for the multicolor design. Holiday cards are a great way to reach out to old customers or to say thank you to existing ones. 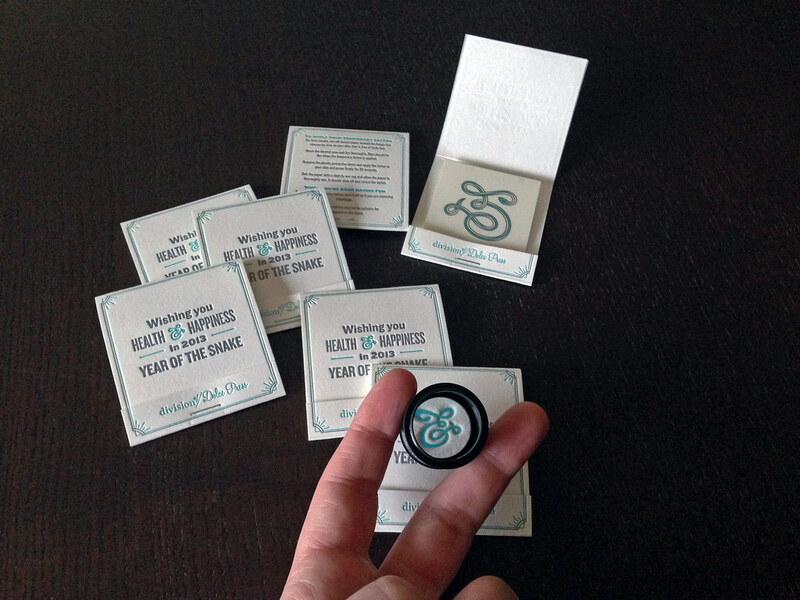 While the message of a corporate card should be consistent with your branding, you can always have fun with them! A few weeks ago we announced the new 2015 Holiday Collection (Foil Filled Holiday Cards). The day before Thanksgiving is the perfect time to share the best ways to customize them. Whether its a custom message, mounted photo, or address seal there are lots of way to make your holiday cards unique. We all get wrapped up with family, cooking, and shopping, so we're also offering guest addressing. Send us your mailing list and we'll print it in full color or white ink. Continuing with our Holiday posts, this custom ornament card we printed is a gorgeous mix of foil and flat printing. The ornament design uses the same die shape from our standard holiday ornaments but adds a custom foil backing in a bright red cover stock. Each ornament was tied with a metallic gold ribbon (1/4") that you can use to hang it on a christmas tree, shelf, or fridge. The holiday ornaments can be customized with a family photo and a special message on the back. Just as promised from yesterday's post (Foil Filled Holidays), here are the newest additions to our 2015 Holiday Collection! This batch boasts bright colors, clean layouts, and of course beautiful foil! Impress your neighbors with these uniquely fun designs. Each card is paired with a foil lined envelope. These designs will be available online in the shop as stock greeting cards or you can customize them with a personal greeting or photo. Today, we're releasing two new designs as part of our 2015 Holiday Collection. The folded cards feature bright colors, modern designs, and best of all foil liners! Send your season's greetings with a sense of elegance and sophistication. Our holiday cards are made from premium paper and envelopes. Looking to customize our designs? We can print a personal message on the card, address your envelopes, or mount a photo on the inside. We're thrilled to announce our first holiday photo card collection is now available online at dolcepress.com/shop/category/holiday-cards. You can browse the full collection of cards (30+ unique designs) which can be customized with edge coloring, foil stamping, 2-sided printing, and more - see the full post for the entire list of options/upgrades. Quantities for custom cards start at 25 pieces and go up to 200 on the website. For larger quantities, contact us for pricing. One of my favorite designs is the Happy Everything (H1) - Holiday Photo Card, which is available with a glitter foil finish! April's TypeCard is here! We worked with Christian Pimentel, a Dominican Republic based graphic designer and artist to create a Titanic Remembrance Day card. The card was hand lettered by Christian with the words, "I Will Never Let Go". 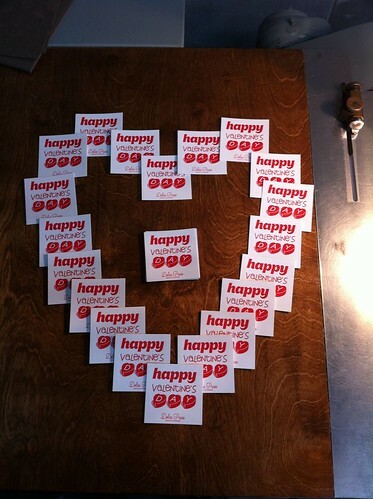 We opted for a folded card this month, the finished piece was 4Bar, the perfect size for a little note! For the ink we hand mixed an arctic blue ice ink and added a touch of silver. As always these cards ship free with every order in the month of April so keep a lookout for them. Titanic Remembrance Day is April 15th, and this year marks the 101st year since the fatal collision. Check out more information on the RMS Titanic here. You can download a photo of the card to use as a background here. We're proud to announce the release of our latest greeting card, Give Me Love. 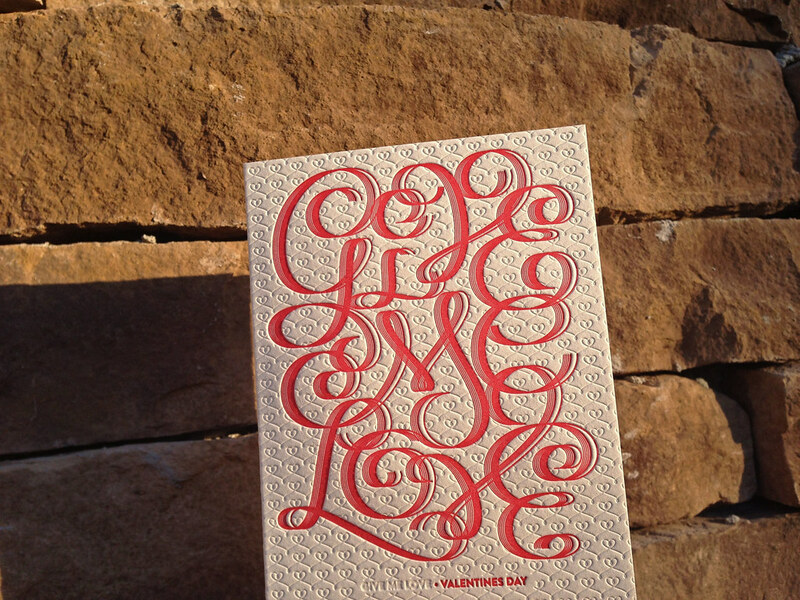 Produced in collaboration with type designer and hand lettering artist Martina Flor the card has a lovely heart pattern printed in blind with the words "Give Me Love" printed in one of 3 colors (Red / Gold / Pink). The finished card is A2 size and comes with a matching envelope. Check out these cards and all of the other amazing prints in our online shop. We're kicking off 2013 with these limited edition letterpress matchbooks with a custom printed temporary tattoo (in collaboration with divisionOf/). 2013 is the year of the snake and the snake themed ampersand tattoo allows you to celebrate in full force. The matchbook was printed on Crane's Lettra in silver and our custom dolce press ink. These amazing gifts are shipping out to our clients and with orders this month (while they last). Get yours today! You might have missed it but this month we collaborated with AtMedia to create a unique TypeCard in celebration of the holidays. The card is printed in holiday red ink and a blind deboss was added to give the finished card extra texture. So, how do you get one of these sweet TypeCards? Nothing! Just place an order through our online shop and we'll include a TypeCard for free. Letterpress TypeCards are an ongoing project where we collaborate with new designers every month to bring new/creative ideas to letterpress through design. Interested in participating? Contact us with your details or leave a comment below and we'll be in touch! We're in the holiday spirit and happy to show off some new wrapping paper we designed specially for the holiday season. Printed on kraft stock, the wrapping paper features hand sketched festive icons in red and green. We've got all of our favorite things including ornaments, reindeer, holly-berries, candy canes, snowmen, stars, christmas trees, and stockings. To help spread the holiday cheer, all of our orders for the month of December will be wrapped in this limited edition paper. Ordering a gift from our shop for a friend? Let us know and we'll include some sheets with your order when it ships. Take at look at what's new, Coasters! And not just any coasters but a letterpress Mixed Drink Coaster Set! Every set includes 10 coasters each with a different mixed drink. From margaritas to bloody mary's you are sure to find one of your favorite cocktail recipes. The coasters were printed on 425gsm blotter, a textured stock ideal for coasters and durable prints. Better get your hands on them quick before they are all gone! Take a peak at the newest additions to our letterpress holiday lineup, gift tags. These aren't ordinary gift tags, we've turned them up a notch with whimsical designs and bright colors. The front is letterpress printed and the back is flat printed with a space for names. We used 425gsm blotter stock instead of traditional lettra to make them extra sturdy. Each hang tag is die cut with a circle die and then we string ribbon through the hole so they're super easy to add to any gift. Pick them up in our shop now before they're gone! 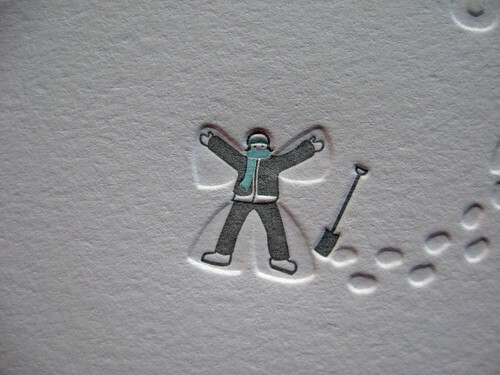 We happy to announce the newest addition to our letterpress holiday card collection. Holidays Gifts is letterpress printed with two colors (blue-green & pale orange) on pearl white lettra (300 gsm) paper. All of the gifts were designed with different wrapping paper which when printed gives the card a great textured effect. The ink colors are perfect for your modern holiday celebration. We are happy to share with you our newest addition to our holiday collection the Choo Choo Holiday Card. The Choo Choo card is letterpress printed with two colors (candy cane red & cloud blue) on pearl white lettra (300 gsm) paper. The words "Happy Holidays" are drawn out in puffs of smoke coming from Santa's Choo Choo train. Lets help Santa and Rudolph deliver their presents to all the good boys and girls. The cards are $4.50 each or $14 per pack (6 cards). 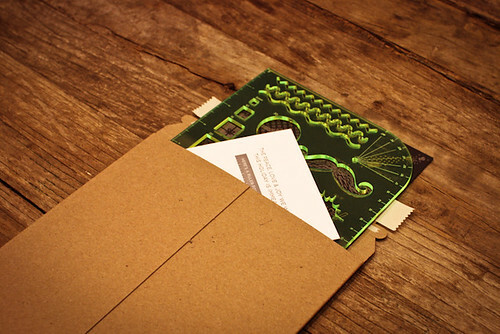 Each card comes with an A2 cotton envelope. We're so excited to announce our newest holiday card, the Jolly Holly card. It is sure to spread lots of holiday cheer. 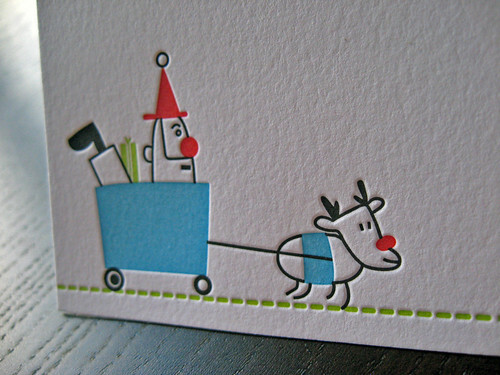 The card is letterpress printed on pearl white crane's lettra (300gsm) in two colors (candy cane red & green). This card was inspired by Christmas holly and is perfect for the holidays. You are sure to have a Jolly Holly Day! Thanksgiving was the perfect time to release 2 of our newest holiday creations. The first was inspired by our black lab parker because dogs need holiday cards too! Vote for us on Uncommon Goods!